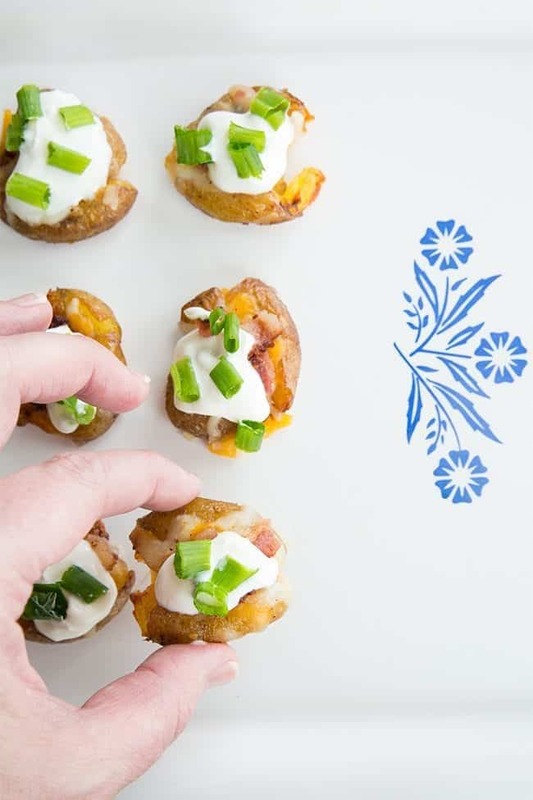 Try not to squee over how cute these mini loaded smashed potato bites are. Also try to resist eating the entire pan of them, because as we all know, when food is mini, it’s calorie free. Fairy tales and wishes aside, hot dang folks, these are the perfect summertime appetizer or side dish. 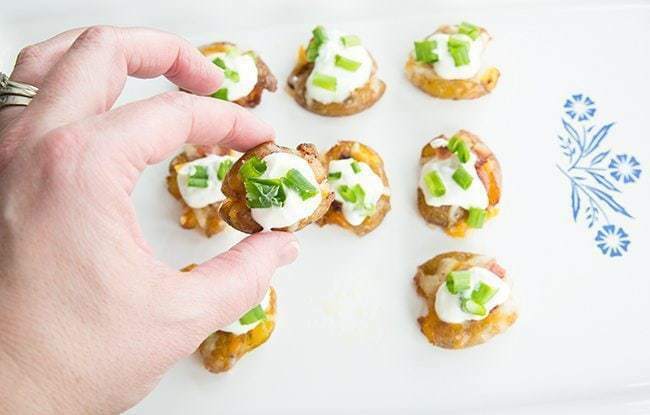 I actually could make a meal out of these easily, but I whipped them up with the intent of having a deliciously new finger food for my summertime soirees. They are super easy. Boil baby potatoes. Smash baby potatoes. Sprinkle sea salt and olive oil on baby potatoes and bake until crispy. Take ’em out and place loaded baked potato fixin’s on them all. Evilly easy. My favorite type of recipe. If it wasn’t infringing on someone else’s copyright, I’d be telling you that exact phrase applies to these beauties. Like I said, there’s no reason you can’t eat a plate full of these and call it dinner. I won’t judge you. Are you ready for another little secret? 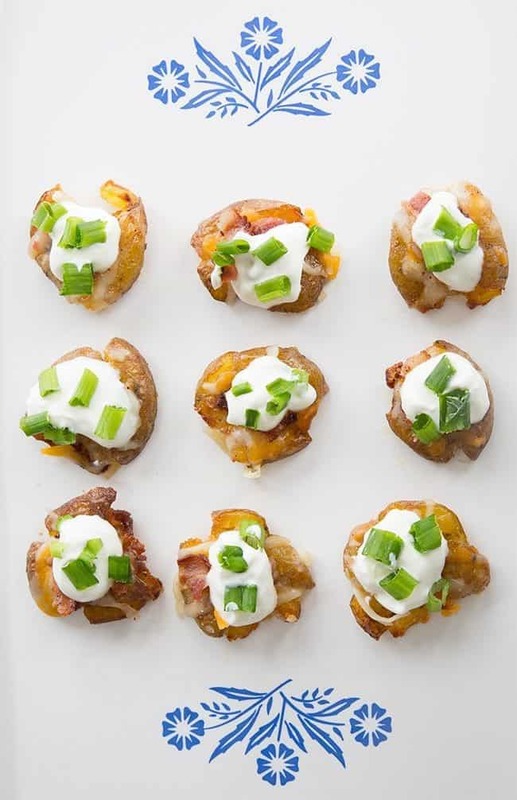 Actually, it’s a pretty lame one and anyone that had made my Absolute Best Ever Twice Baked Stuffed Potatoes is already familiar with the secret. Told you it was lame, but it’s true. Seasoning salt is a must here for the best flavour combination possible. You can use plain sea salt but trust Magpie, seasoning salt makes these amazing! Now admit it, who’s going to eat a solid dozen of these and call it a night? 1-2 cups of shredded cheese I love Tex Mex! Line 2 baking pans (That fit side by side in your oven) with parchment paper then drizzle olive oil over it. Place potatoes on baking sheet and gently flatten them using a potato masher, making sure to try and keep them together. Make sure that there is oil under them! 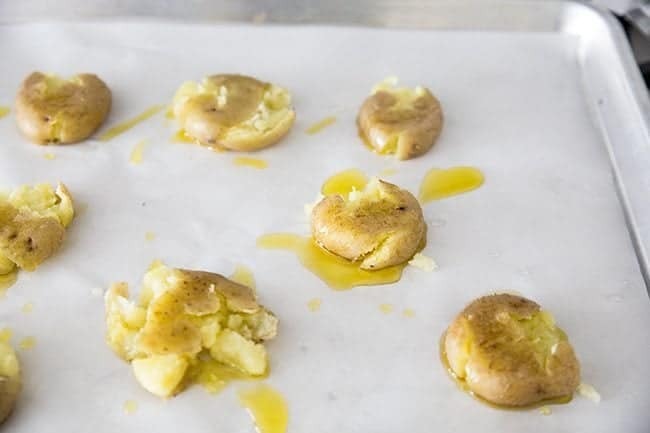 Repeat until you have all of the potatoes on the baking sheets, then drizzle with extra olive oil. Sprinkle with seasoning salt. Bake in the oven for 15-20 minutes or until they are browned and crispy. The crispier these are, the better they taste! 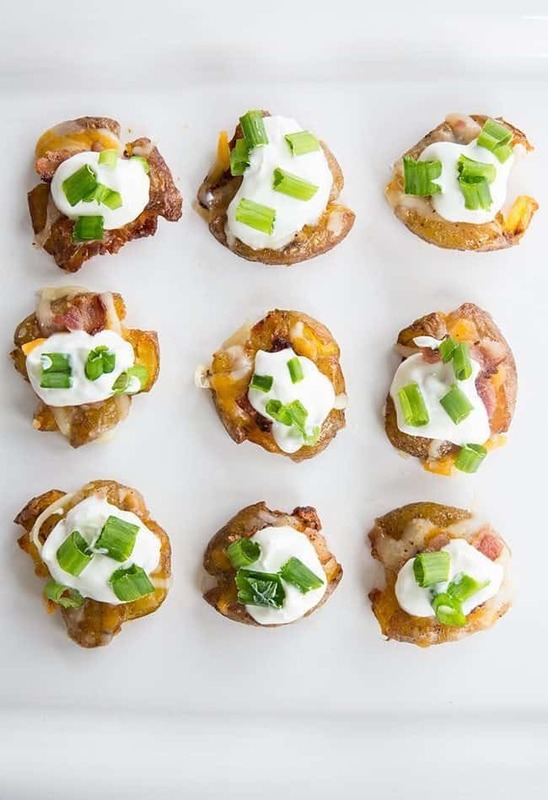 Top each potato with sour cream, bacon, cheese and green onions. Place on serving plate and let everyone help themselves! Side Note: I take baby potatoes, bake em or nuke em. Squash them flat, top them with olive oil and fennel seeds. Bake for a few minutes and enjoy!